Why does a piano sound like a piano? A similar question can be asked of virtually all musical instruments. A particular note-such as middle C-can be produced by a piano, a violin, a clarinet, and many other instruments, yet it is easy for even a musically untrained listener to distinguish between these different instruments. A central quest in the study of musical instruments is to understand why the sound of the "same" note depends greatly on the instrument, and toelucidate which aspects of an instrument are most critical in producing the musical tones characteristic of the instrument. The primary goal of this book is to investigate these questions for the piano. The explanations in this book use a minimum of mathematics, and are intended for anyone who isinterested in music and musical instruments. 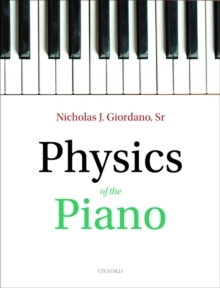 At the same time, there are many insights relating physics and the piano that will likely be interesting and perhaps surprising for many physicists.